Can you confirm these amateur observations of Haitiophis anomalus? Diagnosis Diagnosis (genus): The single species in this genus has 21 midbody scale rows, 207–215 ventrals, 113–130 subcaudals, 2 apical scale pits, 8 upper labials, 10 lower labials, 14 total maxillary teeth, and 18–19 dentary teeth (Table 2). Haitiophis differs from all other genera except Alsophis in its high number (21) of midbody scales, and from Alsophis in its low number of total maxillary teeth (14 versus 18–21) and dentary teeth (18–19 versus 21–26). 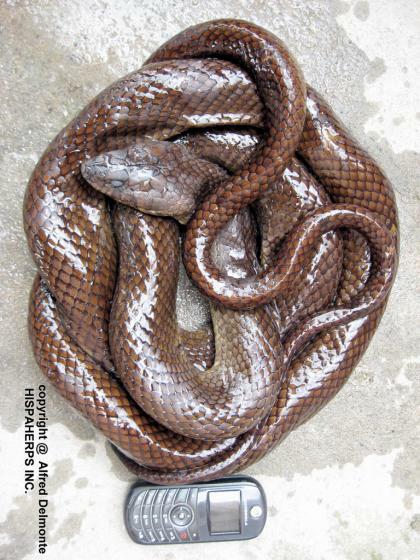 Comment Type species: Zamenis anomalus PETERS 1863 is the type species of the genus Haitiophis HEDGES & VIDAL 2009. This species can spread its neck, almost like a cobra. Diet: anoles and other animals. Etymology Etymology (genus): The generic name is derived from the Taino word Haiti (meaning high mountains) for the entire island now called Hispaniola and refers to the distribution of the genus. Peters, W. 1863. Über einige neue oder weniger bekannte Schlangenarten des zoologischen Museums zu Berlin. Monatsb. Königl. Akad. Wiss. Berlin 1863: 272-289.